Urban walkability is determined both by built environment features and pedestrian characteristics. Research has shown that factors influencing women’s walking differ than those affecting men’s. Using a mixed-method approach, this study aims to create a new women-specific walkability index and answer three questions: 1) Which variables most influence women’s propensity to walk? 2) Where in San Francisco are the most and least walkable places for women? And 3) Does the leading walkability index at present, Walk Score, account for women’s walkability? 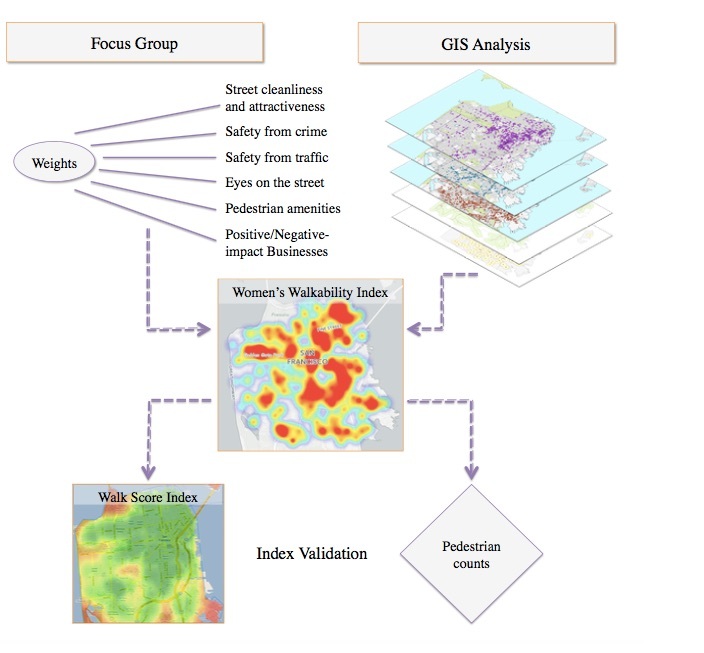 Focus group participants (n=17) ranked crime, homelessness and street and sidewalk cleanliness as the three most influencing factors on women’s walkability, accounting for 56%-67% of the Women’s Walkability Index’s total score. The lowest walkability areas in San Francisco according to this index are the Downtown and South of Market (SoMa) areas, which are some of the most walkable neighborhoods in the city according to Walk Score, despite high crime and homelessness density. Walk Score is negatively correlated with the new Women’s Walkability Index (Spearman’s rho = -0.585) and is therefore concluded to inaccurately represent women’s walkability.